England wicketkeeper-batsman Craig Kieswetter has vowed not to change his aggressive style of play, despite suffering a horrific facial injury. Kieswetter broke his nose and fractured his eye socket against Northants in July and returned with a fluid 69 off 80 balls against Middlesex on Monday. "I have always taken on the short ball and always will," he told BBC Somerset. "It is one of my strengths but sometimes it can be your downfall, as you saw at Northants." The 26-year-old made a statement of intent in his comeback game by launching the first short ball he faced for a maximum off Toby Roland-Jones' bowling. Kieswetter has played 46 one-day internationals and 25 T20 games for England and has a strike rate of more than 85 in both formats, although he had slipped down the pecking order before his injury. "It was nice to score runs - and to do it in the manner I did was quite important," added the South Africa-born player. "I did not want to go out there and be scratchy and tentative, I wanted to go out and play my normal natural aggressive attacking game and it came off nicely." Kieswetter also highlighted the support from Somerset and their fans as a key reason for his early return, after initial expectations that the injury had ended his season. Kieswetter tweeted: "Operation went well - little bit more damage than expected. The road to recovery starts now." Kieswetter missed a total of 13 matches, including three T20 Blast matches. 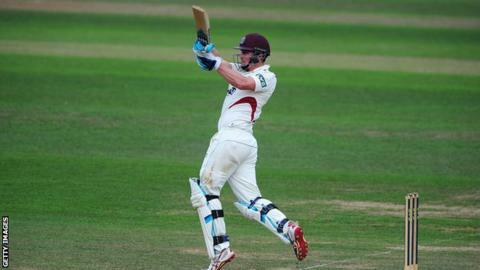 Somerset's entire One-Day Cup campaign and two County Championship matches. "I got goosebumps walking out to bat, which was strange, but very humbling and I had to try to reset myself once I got to the crease," he said. "That welcome from the supporters puts into perspective the support, following and care that we get as players. "Sometimes because of circumstances and situations we can be a bit aloof towards our supporters but that instance showed me just how much care there is around this club."